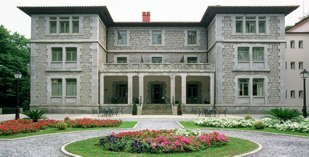 This four star Parador is in the Palace of Eguilior which is surrounded by 5 hectares of park land. The park contains many specimen trees. The most important of which are the hundred year old laurels which have been designated World Heritage Site by UNESCO. Among the varieties of importance are the ash trees, the maples and the magnolias. The estate also contains one of the best examples of the mixed forest which covered a big part of Cantabria many years ago. The palace was constructed in the 19th century by the architect Emilio de la Torriente combining rustic and modern features which was fashionable at that time. It is a large square building with towers at the corners. You pass through the substantial stone walls using a large wooden door which was the inspiration for the makers of many of the furnishings inside. Facing you on entering, is the central staircase where the walls are decorated with hangings from the Bauhaus collection which imitate the design of the window which dominates the first landing. During the reign of King Alfonso XIII it was the most important building in the area and in which some of his ministerial councils were held. The Limpias Parador has 18 rooms on the restored Eguilior Palace and a further 47 rooms in a newly constructed building. The new construction combines mountain architecture with galleries and large glassed areas. There are fifty seven rooms with twin beds, seven rooms have living rooms en suite and also, on the top floor of the new building there are six large rooms with views of the surrounding gardens. All bedrooms have telephone, television, minibar and a safe. There is also one easy access bedroom. 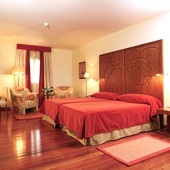 The rooms have been tastefully furnished using chestnut wood with a contemporary design. The beds have magnificent carved wooden headboards and textiles in bright colours. In addition to the lounges in the palace, there is a restaurant, bar and cafe. Facilities include air conditioning, central heating, currency exchange, conference facilities, gymnasium, garage, satellite television and free wireless internet. Outside there is a seasonal swimming pool which is open during the summer season, tennis and paddle tennis courts and, of course, a vast beautiful garden. The restaurant specializes in the local cuisine which is based both on products from the mountains and fish from the nearby sea. A special menu for those on a gluten free diet is available. Local festivals include: Parade with floats made of flowers on the last Friday of August; Santoña Carnival, usually held in February; Celebrations in honour of La Bien Aparecida, patron saint of Cantabria, on the 15th September. The Parador of Limpias is approximately 59 kms from Bilbao and the famous Guggenheim museum, designed by the American architect Frank O. Gehry. Distance from the nearest airport is approximately 44 kms, train station is 1 km away and the nearest port is 44 kms away. .We found this parador by accident. Although not old old, it was a very pleasant place located in wonderful grounds. We used the outdoor pool (there is one inside as well) to cool down after a very hot day. Everyone was very nice and helpful. Highly recommended. A lovely paradores , dining room staff superb and excellent menu.....however the rooms were cold and in the new extension the curtains were mouldy... It seems there was a problem with the double glazing. I had an allergic reaction to the mold , fortunately I had some antihistamine with me but still felt very ill, especially in dining room before I realised my problem . Dining room staff were extremely kind but admin staff did not show any concern. First time in nothern part of Spain. We (sister, brother in law and myself ) came from Japan. We staied parador Limpias. Unfortunaly only one day at the Parador. It was the best place to stay Parador Limpias. it was very comfotable. Good foods in restaurant and good wine especialy good peaple to serve us./ We have been talked parador Limpias again again,,,,,,,, Thank you all for your hospitality and we will visit again. We stayed for 2 nights before journeying back to Santander and our return to England. We had a pleasant room overlooking the gardens which had a lovely big balcony. Unfortunately the weather was too wet to use it. Breakfast was perfectly adequate. 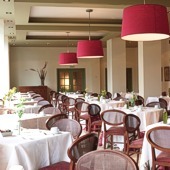 The meals in the restaurant were very good and we found the hotel staff very friendly and helpful. The bar was sometimes unattended but reception would put out a call and one of them would come and serve. A very good base to start or end your holiday in that part of Spain. We loved all the Paradors we stayed in. I would recommend anyone to try them. Parador de Limpias is hotel in a 19th century Palace in a large beautiful estate.